A test that is required for determining the flexibility of concrete in a specific batch is known as a concrete slump test. The smoothness of the flow of the concrete is called its flexibility, which refers to the degree of wetness. We can apply this test on a freshly made concrete for measuring it. The mixes that are wet are working well in comparison of dry wine. When the consistency of two concrete is similar, its ability to work can be different from each other. Also, we can find the consistency in two individual batches through this test. It is a very simple test. The equipment that is required for it are also very simple. Because of the simplicity of the test there is an availability of high range of variability in the manner of it. Usually, this test is required for finding the consistency of different batches under the certain conditions. First of all a slump cone is required, it is also known as a mould. Place this cone on a hard non-absorbent base. The fresh concrete should be filled inside it in different stages. By using a rod each layer is hammered 25 times separately. When this process is finished with the third stage the concrete is smashed into the flush to the upper point of the mould,Lift it vertically to the top by twisting it. Be careful that the concrete cone should not be affected by it. The simplicity and best features of this test is make it able to use widely. The sudden increment in moisture content can be determined by the increment in a slump. Through it we can determine the effects of plasticizers in the summary of it. Through this test we can find the difference of the materials in a specific time period, it is a very effective method that is used on the sites. Also, if any, difference is occurring in classifying the aggregate, it can be found out very easily through this test. We can find the uniformity of individual batches of same concrete through this test. When a slump is getting very high or low at that time a warning is given by it so that the mixer operator can manage it. 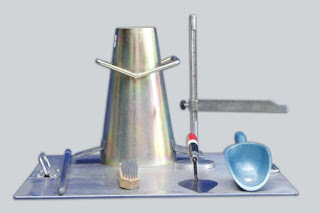 Condition of test equipment, slump-testing technique and concrete sampling. Effectiveness, sequence of addition, interaction, combination, type and dosage of Chemical admixtures. Free water in the concrete. Methods and equipment of concrete batching, mixing and transporting. Mixing of concrete, while testing. Temperature, cleanliness and Size of cementitious. 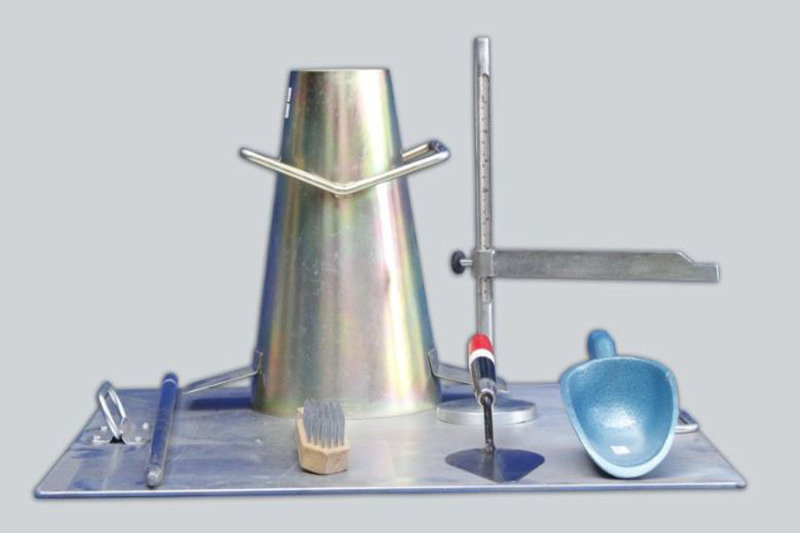 We are manufacturer and Supplier of Slump Test Apparatus. We are exporters of Civil Engineering Instruments.